The ability to manipulate single molluscan neurons holds tremendous potential toward the identification and characterization of various genes and their encoded proteins regulating synapse formation. One possibility for future exploration will be the identification and characterization of a full complement of both pre- and postsynaptic proteins involved in synapse formation. This functional proteomics approach has already enabled the identification and characterization of a whole array of proteins within specific compartments of select mammalian neurons57,58. Although these mammalian neurons hold tremendous potential for identifying synapse-specific proteins, the molluscan neurons due to their larger somata, are perhaps better suited for such functional proteomics approaches. For instance, Jimenez and colleagues59 have recently successfully identified and characterized a full complement of neuronal neuropeptides at the level of a single cell. This approach can now be employed to identify various proteins during synapse formation - at the level of single pre- and postsynaptic neurons. 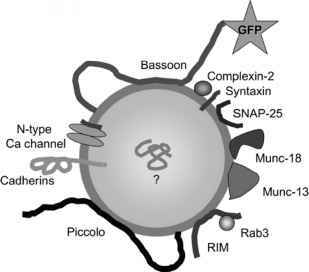 These proteins can then be manipulated experimentally to determine their exact involvement in synapse formation and synaptic plasticity. Lymnaea model was recently used to successfully interface individual neurons with silicon chips and a bidirectional communication was established between brain cells and this electronic device60. This approach now provides an unprecedented opportunity to examine the role of activity-dependent mechanisms in synapse formation and synaptic plasticity at a resolution that has never been attained before. Figure 2.4. Synapse Formation as Revealed Through Brain-Chip Neuron Interfacing. (A) Identified Lymnaea neurons can be successfully interfaced with silicon chips (Kaul, Syed, Fromherz, unpublished data). The cultured cells can either be soma-soma paired (A) or allowed to extend neurites to develop networks (B). This approach has been used to reconstruct specific synapse on the chip which was subsequently used to stimulate and record synaptic activity and plasticity.